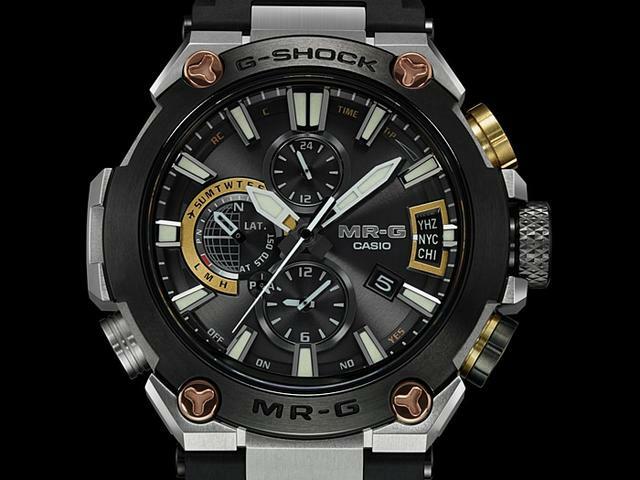 (Sponsored post) Already well known for their super shock resistant watches, G-SHOCK has added a watch to the premium MR-G collection that emphasizes strength and grace. The new G-SHOCK MRGG2000R-1A features a robust Dura Soft Fluoro-Rubber band with a traditional Japanese Bishamon-kiko pattern on the band that is both strong and comfortable on the wrist. This traditional Japanese finish, which combines hexagonal shapes into groups of three, was often seen on the armor of Bishamonten – a group of warriors that symbolized ultimate strength in battle. The G-SHOCK MRGG2000R-1A features an extra-strong Dura Soft Fluoro-Rubber Band. A view of the monogrammed caseback, patterned rubber strap and steel buckle. 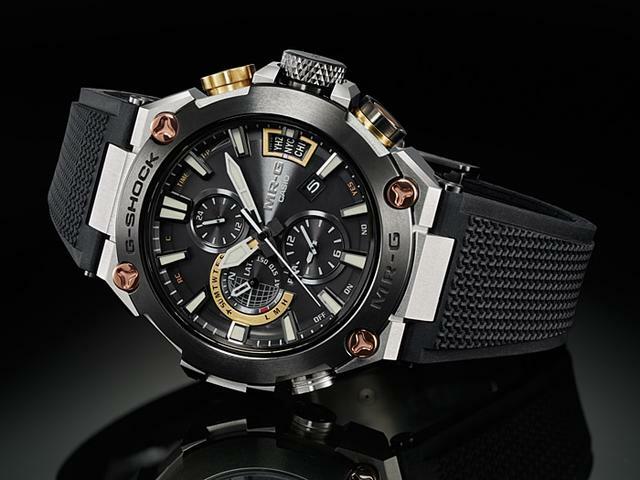 And, in a G-SHOCK premiere, the strap connects to the specially coated titanium case with L/R-Δ Loc (pronounced L-R Delta Loc), which Casio co-developed in partnership with NejiLaw. 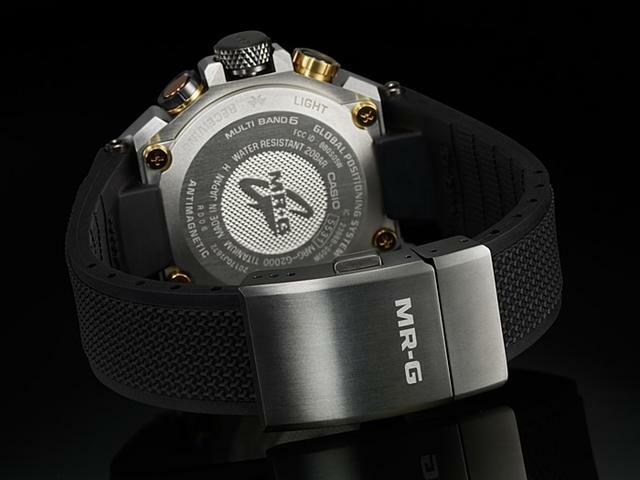 The G-SHOCK MRGG2000R-1A marks the first application of the L/R-∆ Loc mechanism, jointly developed with NejiLaw. The connection features two nuts that lock together and spin in opposite directions. Its purpose is to prevent screws from coming loose due to vibration and other forces. 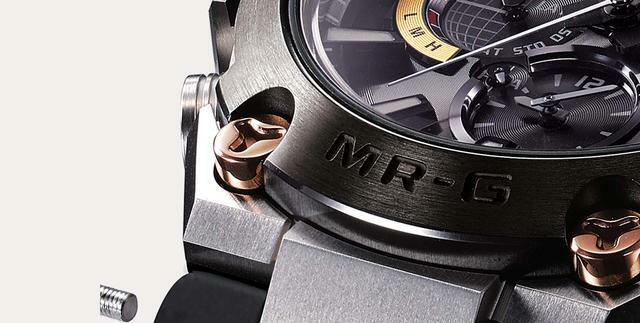 The titanium used in the MR-G case and band is exceptionally scratch resistant. The aforementioned case coating places a diamond-like carbon layer on the case that increases abrasion resistance. 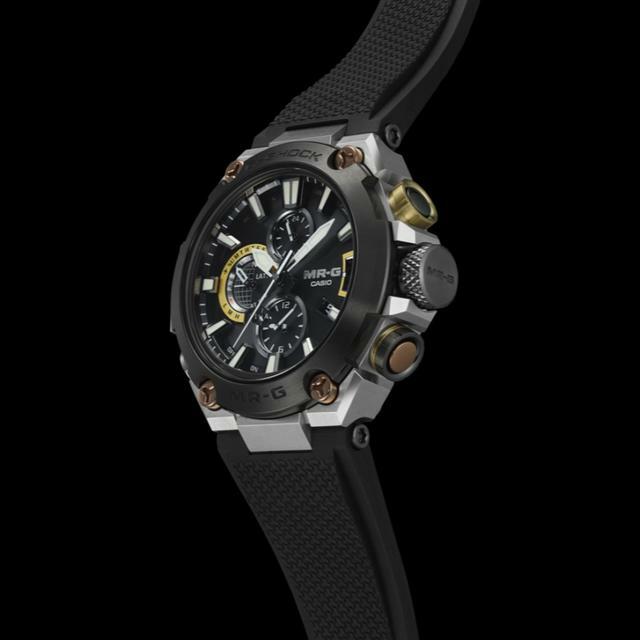 The titanium itself is already G-SHOCK tough, made using a deep layer hardening process to render it up to five times tougher than titanium used elsewhere. This coating renders the case, band, buckle and links (in the band) extra wear resistant. Additionally, this model features high clarity, resist scratching sapphire glass with non-reflective inside surface coating. 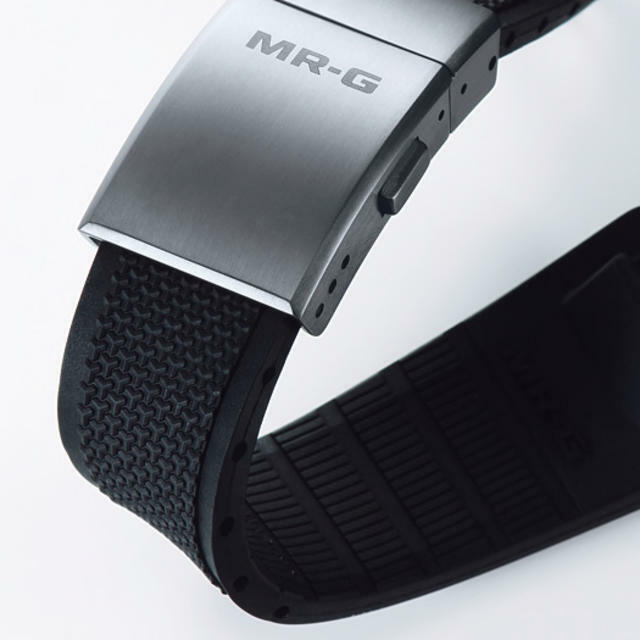 In addition to auto time adjustment, World Time (more than 300 cities), and other features, the MR-G Connected app also displays important information about the watch status. 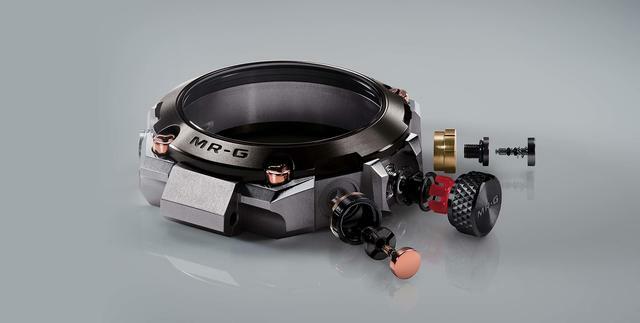 Of course, the MRGG2000R-1A delivers all the top-of-line timekeeping functions you’d expect from G-SHOCK, including G-SHOCK's legendary Multi-Band 6 technology, tough solar technology, and Bluetooth connectivity through the G-SHOCK Connected app. On the dial you'll find indications for date, airplane mode, world time (39 cities + UTC), daily alarms, stopwatch, countdown timer and more. 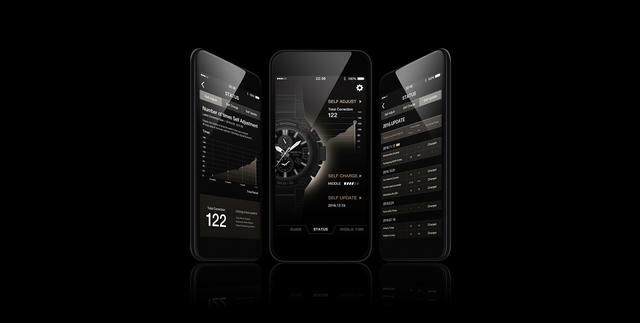 Each timepiece also comes equipped with standard G-SHOCK technology of: 200M water resistance and shock resistance, automatic date update, airplane mode, world time (39 cities + UTC), Super Illuminator LED light, daily alarms, full auto calendar, stopwatch and countdown timer and day/date display, all within its 49.8mm case. 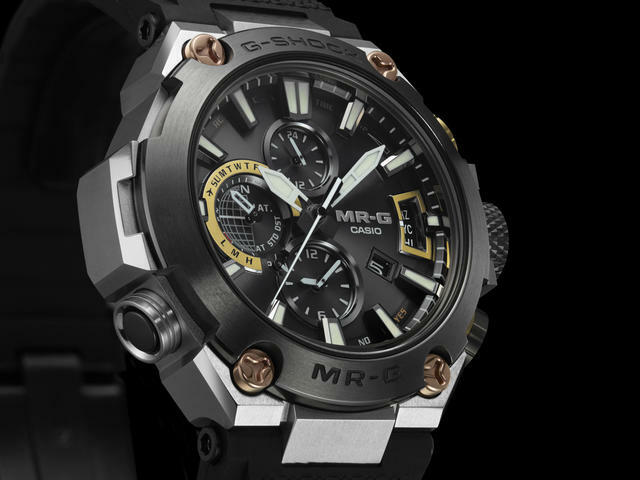 The MRGG2000R-1A ($2,800) is available at selected authorized G-SHOCK retailers and G-SHOCK Soho Store.